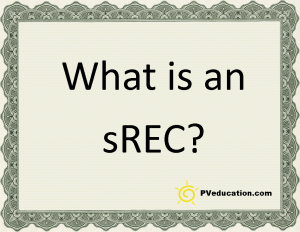 Wondering what an sREC is? sREC stands for Solar Renewable Energy Credit. If you google the term there is a lot of in depth information available that will let you understand all the details related to your state. Here is my short answer leaving out the specific details for any one state. As some utility markets were deregulated the legislation passed included what is called an RPS, Renewable Portfolio Standard. The RPS basically says that a portion of the electric used in the state has to come from clean renewable resources, typically 20%. Of this typical 20% some states specifically stated what renewable technologies had to be used. In this example the state might have created a carve out of 2% that had to be solar. Wondering why I’m avoiding state specific information, every state was different and in some cases very different. For example if a state was heavy into the coal industry the definition of a renewable resource was stretched to include coal. A couple of good things happened when the RPS was created and one was financial penalties that the utilities have to pay if they don’t comply. In my opinion one of the bad parts about some of the RPS designs were states that allowed for cross border trading of the renewable energy credits. Due to the forces of supply and demand states that opened trade to other states saw the value of the sREC plummet. The best examples are states that have a requirement that the renewable energy has to be produced inside their state borders. This keeps the sREC price higher then other areas and helps foster growth of renewable energies in that state. An sREC is equal to 1000 kWH of solar production. Utilities typically purchase these on an open market by bidding for in an auction. The price the utilities pay for the sREC is capped at the level of the fine imposed for noncompliance. The prices paid are essentially market driven by supply and demand so the prices will change over time. If you are interested in the current value of an sREC I would recommend looking for an sREC broker like srectrade.com where you will find charts showing the historical prices per state. Companies like this gather sREC from a lot of small system owners and make it easier on the utilities buy them in large blocks. I use srectrade.com currently to sell all my sREC and I’m very happy with their service. They automatically sell the sREC my solar systems generates, they keep their small reasonable commission and make send me the proceeds.Overall it is an easy process and it provides a income stream from the solar system. Let me first say that I’m not a tax adviser and you should talk to your tax adviser. As tax time approaches each year I see questions about sREC’s and if they are taxable or not. As of this writing the IRS hasn’t been clear about if sREC income is taxable or not. My personal opinion is that they are taxable as income. I’ve read about people debating that they are not taxable because they are off setting the cost of a solar system and that no profit is being made because the cost is greater then the sREC’s received. An sREC is not a subsidy or a rebate, if it was the 30% federal tax credit should be calculated based on this reduced amount resulting in a lot smaller tax credit. With an sREC you are selling a certificate and in exchange for money and this needs to be accounted for as part of your gross income. Again…just my opinion!